Charlene Chan looking stunning with our Evangeline heels for her wedding. Shop this season’s Angel Wings. 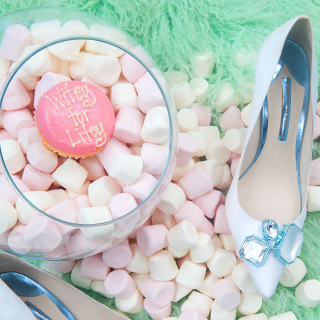 You don’t have to look far to find the perfect pair of shoes for your big day! Sophia has re-imagined a selection of seven of her signature shoe styles and her iconic speech bubble clutch in a romantic palette of baby pink, ice blue and ivory. The collection ranges from classic satin pumps with crystal bead heels, to strappy fluffy pom pom’d sandals, to the signature butterfly wing ‘Chiara’s’ in metallic pearl and ice blue leather. And, every pair of shoes in the collection is marked on the soles with Sophia’s signature ‘WIFEY FOR LIFEY’ slogan. Sophia realised the potential for a bridal collection after she found a lot of women tagging her on Instagram in their wedding photos, having chosen shoes from her main line for the big day. Her most bride friendly heels were sell out styles, so it just seemed like a natural progression to start a fully designed bridal offering. Sophia designed every aspect of the shoes to be extra special, from the ice blue stitching on the sole, to the ice blue shoe box which opens with an iridescent ribbon bow. Perfect for making any blushing bride’s big day extra special! Sophia got married back in 2014 wearing her Lacey sandals, which feature in this collection. Take a peek at the Vogue feature on her wedding here.